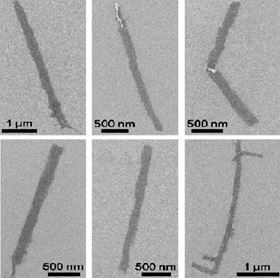 These microscope images show graphene nanoribbons unzipped from multiwalled carbon nanotubes. When their edges are modified with PEG, the nanoribbons provide conductive surfaces for neuronal growth. Image: Tour Group/Rice University. A combination of graphene nanoribbons made with a process developed at Rice University and a common polymer could someday be of critical importance for healing damaged spinal cords in people, according to Rice chemist James Tour. The Tour lab has spent a decade working with graphene nanoribbons, starting with the discovery of a chemical process to ‘unzip’ them from multiwalled carbon nanotubes, as revealed in a Nature paper in 2009. Since then, the researchers have used them to enhance materials for the likes of deicers for airplane wings (see New graphene coating helps put ice in a spin), better batteries and less-permeable containers for natural gas storage. Now their work to develop nanoribbons for medical applications has resulted in a material dubbed Texas-PEG that may help knit damaged or even severed spinal cords. A paper on the results of preliminary animal-model tests is published in Surgical Neurology International. Graphene nanoribbons customized for medical use by William Sikkema, a Rice graduate student and co-lead author of the paper, are highly soluble in polyethylene glycol (PEG), a biocompatible polymer gel used in surgeries, pharmaceutical products and other biological applications. When the biocompatible nanoribbons have their edges functionalized with PEG chains and are then further mixed with PEG, they form an electrically active network that can help the severed ends of a spinal cord to reconnect. “Neurons grow nicely on graphene because it’s a conductive surface and it stimulates neuronal growth,” Tour said. In experiments at Rice and elsewhere, neurons have been observed growing along graphene. According to Tour, although only 1% of Texas-PEG consists of nanoribbons, that’s enough to form a conductive scaffold through which the spinal cord can reconnect. Texas-PEG succeeded in restoring function in a rodent with a severed spinal cord in a procedure performed at Konkuk University in South Korea by co-authors Bae Hwan Lee and C-Yoon Kim. The material reliably allowed motor and sensory neuronal signals to cross the gap 24 hours after complete transection of the spinal cord, leading to almost perfect motor control recovery after two weeks. “This is a major advance over previous work with PEG alone, which gave no recovery of sensory neuronal signals over the same period of time and only 10% motor control over four weeks,” Tour said. The project began when Sikkema read about work by Italian neurosurgeon Sergio Canavero. Sikkema thought nanoribbons might help to enhance PEG’s ability to promote the fusion of cell membranes by adding electrical conductivity and directional control for neurons as they grow to span the gap between sections of the spinal cord. Contact with the doctor led to a collaboration with the South Korean researchers. Spinal cord repair with graphene-polymer nanoribbons.